iPhSoft has just released an iPhone port of Simon the Sorcerer [link] through the App Store. 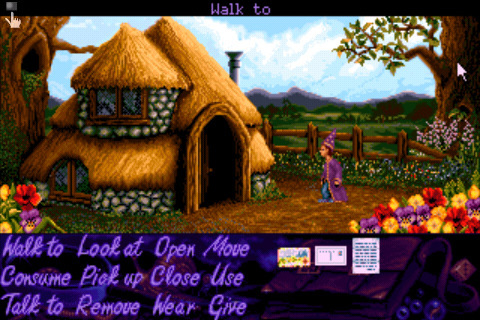 The first installment of a well reviewed adventure series that debuted in 1993, Simon the Sorcerer is a ScummVM title that has been compared to the Monkey Island series as far as its overall style and humor. There are some things that kids just shouldn’t have to put up with. Being transported to some weird dimension full of goblins, dwarves, swamplings, stupid wizards and sleeping giants is definitely one of them. Simon is a teenager transported into a fantasy world as a sorcerer dressed in a cloak and pointy hat. He must use his logic and magical skills to solve puzzles as he progresses through the game. The story begins with young Simon and his dog Chippy discovering a spellbook in his attic. The spellbook opens a portal through which Simon and Chippy enter a strange and different world. After dodging some hungry goblins, Simon discovers that he’s been summoned to rescue the wizard Calypso from the evil sorcerer Sordid. Simon must use his magical skills to solve puzzles in order to progress through the game, but this is made somewhat difficult by his overall rude manner, forcing him to go to great lengths to get the job done. The game parodies a variety of popular works, including The Lord of the Rings, The Chronicles of Narnia (the first sequel is called The Lion, the Wizard, and the Wardrobe…), Jack and the Beanstalk, and Rapunzel. A novel Touch Controls Mode, designed and highly optimized for touch screens. Includes the acclaimed ScummVM project. New Remastered Music by James Woodcock. Currently available in English and will soon be available in French, German, Italian, Spanish and Hebrew. Full voice acting in English and German editions. Numerous locations to visit, including: Drunken Druid Tavern, Goblin Fortress, Dwarf Mine, Witch’s House and resting places of fabulous creatures such as Sleeping Giant, Fearsome Dragon and a Sensitive Barbarian. Dozens of interesting characters to talk and interact with, including: Wizards, Smart Owl, Swampling creature, Troll, Dwarfs, thousands of Woodworms, Two-Headed Store Owner, Dodgy Salesman and the local Barman. Thousands lines of funny dialogue. Have a look at the developer’s video of the iPhone release. Some early adopters in our forum seem to be enjoying the release. Next PostNext Gameloft Also Entering the 99¢ Casual Market?